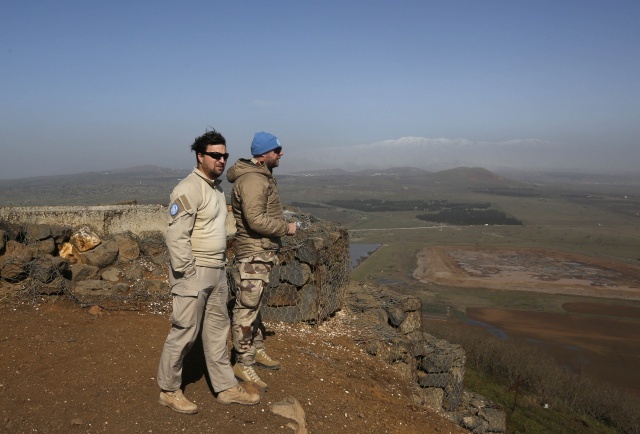 United Nations personnel stand at a lookout point as they monitor the Israel-Syria border in the Israeli-annexed Golan Heights, on January 21, 2019. Prime Minister Benjamin Netanyahu said today Israel would not allow "Iranian aggression", after its military struck what it called Iranian targets in Syria in response to missile fire. (AFP) - Israel struck what it said were Iranian targets in Syria on Monday in response to missile fire it blamed on Iran, sparking concerns of an escalation after a report that 11 fighters were killed. Israel announced the strikes against facilities it said belonged to the Iranian Revolutionary Guards' Quds Force as they were occurring, continuing its recent practice of speaking more openly about such raids. It said the strikes were in response to a medium-range, surface-to-surface missile the Quds Force fired from Syria at the Israeli-occupied Golan Heights on Sunday, which Israeli air defences intercepted. "The air force struck a strong blow against Iranian targets in Syria after Iran fired a missile from there toward Israel," Israeli Prime Minister Benjamin Netanyahu said. "We do not allow such acts of aggression to pass by. We are acting against Iran and against the Syrian forces who are tools of Iranian aggression." Iranian media quoted Air Force Commander Aziz Nasirzadeh as saying "our current and future generations are eagerly and full-heartedly ready for battling with the Zionist regime and eradicating them from the face of the earth." "We assure the Iranian people that we are ready to retaliate against any threat," he was quoted as saying, though it was not clear if he spoke before or after the Israeli strikes. Israel said targets included munitions stores, a site at Damascus International Airport that was allegedly the Quds Force's main logistics hub in the country, an Iranian intelligence installation and an Iranian military training camp. It said it also hit Syrian air defence batteries in response to dozens of missiles fired from them. The Syrian Observatory for Human Rights war monitor said at least 11 pro-regime fighters, including two Syrians, were killed. Russia, which like Iran is a key backer of Syrian President Bashar al-Assad in the country's war, said the Israeli strikes killed four Syrian soldiers and wounded six, while damaging Damascus airport infrastructure. The Observatory said air strikes and ground-to-ground missiles hit targets around the capital including near the Damascus airport, as well as near the Thaala military airport in Sweida province to the south of the capital. The targets included weapons depots belonging to the Lebanese Shiite movement Hezbollah and Iranian fighters, it added. The chain of events leading to the strikes began Sunday. Damascus initially accused Israel of carrying out raids in southern Syria. Syrian state news agency SANA quoted a military source saying Syria's air defences went into action after Israel launched the air strikes. In those strikes, the Russian army said Syrian air defences had destroyed seven Israeli projectiles, after four of the Jewish state's F-16 military planes "fired rockets into Syrian territory". Shortly afterwards on Sunday afternoon, Israel said it had intercepted what it then called a rocket fired at the Golan Heights from Syria. Video spread online of skiers on Mt. Hermon in the Israeli-controlled Golan watching air defences fire to intercept the missile. The ski centre was closed on Monday. Israel then early Monday announced it was striking Quds Force targets in Syria while SANA reported that Syrian air defence systems had responded to "enemy" fire. It has carried out hundreds of air strikes there against what it says are Iranian military targets and advanced arms deliveries to Tehran-backed Hezbollah. Its warplanes have been targeted by anti-aircraft fire during such raids, but it has rarely faced surface-to-surface missile fire in response. Netanyahu and other Israeli officials have been speaking more openly about the country's strikes in Syria in recent days, which some analysts partly attribute to the premier wanting to burnish his security credentials ahead of April 9 elections. Others say it carries a strategic military purpose as well by sending a stronger message. But Israel also risks an escalation with Syria and Iran, as well as possibly further angering Russia at a time when the United States is seeking to withdraw its forces from Syria. Military coordination between Israel and Russia in Syria took a hit after a friendly fire incident in September that led to a Russian plane being downed by Syrian air defences during an Israeli raid. The incident angered the Kremlin and complicated Israel's operations in Syria, particularly after Moscow's delivery of the advanced S-300 air defence system there in response. On Thursday, Israeli military officials concluded a series of talks with their Russian counterparts aimed at improving their coordination there. More than 360,000 people have been killed and millions displaced since the start of Syria's civil war with the brutal repression of anti-government protests in 2011.